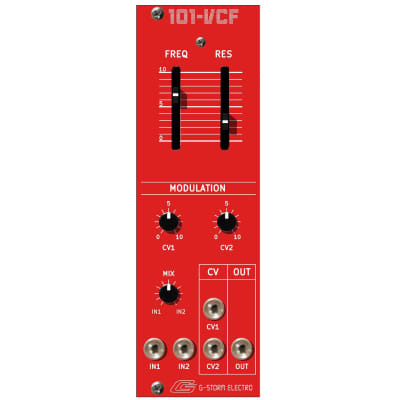 This is no emulation, this is the 101- VCF: a faithful adaptation of the Roland SH-101 low pass resonant filter circuit in a slim, skiff/boat-friendly, 8HP Eurorack format module. It has that un-mistakable sound not found in any other Eurorack clone. Great care was taken to keep the 101-VCF fully analog circuit as close to the original as possible including: a rare OTA filter chip, resonance feedback bias, and thermistor frequency stabilization. The 101-VCF is a little blue beastie that wields two audio IN jacks with a MIX pot. Two CV IN jacks w/ signal attenuation pots allow you to modulate frequency with any two polar/bi-polar signals, low Hz up to audio rates. Every module is hand-assembled and ready to rock your world. Quantities are limited due to fluctuations in parts availability. Do not hesitate, you will not be disappointed. Be sure to check out my other cool modules available in my Reverb store. Includes 16-pin-to-10-pin power connector cable.